Vegan Travel Challenge | As a consultant, I have the opportunity to travel to many different cities and visit various hotels, restaurants, and airports along the way. This blog explores my experiences and research as a traveler adhering to a strict vegan diet. As a consultant, I have the opportunity to travel to many different cities and visit various hotels, restaurants, and airports along the way. This blog explores my experiences and research as a traveler adhering to a strict vegan diet. I recently returned from a quick four and a half day trip to Ireland to travel the Irish countryside with a new boy I’ve been dating in Atlanta, who was touring Europe for a few weeks. This was my first international trip since I started being vegan about a year ago (Yes! I hit the one year mark in June!). I planned to be the best vegan I could possibly be, even if that meant consuming more alcohol than food on some nights. Before my trip, I did a little research and found two very resourceful websites: The Vegan Society of Ireland (http://veganireland.vegaplanet.org/) and a Frommer’s Vegan & Vegetarian Guide to Ireland (http://vegans.frommars.org/ireland/). Even though I found some restaurant options, I knew I was traveling with a carnivore so I stocked up on vegan snacks before I left, with two different kinds of granola bars and pistachios to last me the entire trip. I really can’t believe there are vegans in Ireland, especially because I saw more cows and sheep than people in many of those small Irish towns. Even though there seemed to be plenty of vegan food places, we found ourselves planning very little and stumbling into Irish pubs or small local restaurants when we got hungry. There usually weren’t many options for me on the menu. One time the restaurant had the following options for lunch: Special, Toasted Special, Ham & Cheese Sandwich, and Toasted Ham & Cheese Sandwich. When we asked what the Special was, the server said in his thick Irish accent, “Oh man, it’s a ham and cheese sandwich with tomatoes and onions, and you can have it toasted or not.” Luckily, almost every restaurant had a vegetarian soup, made mostly with carrots which I had pretty much every day for lunch. My dinner was also very consistent, I had roasted potatoes and cooked mixed vegetables, which is usually the side for a big piece of Irish meat. 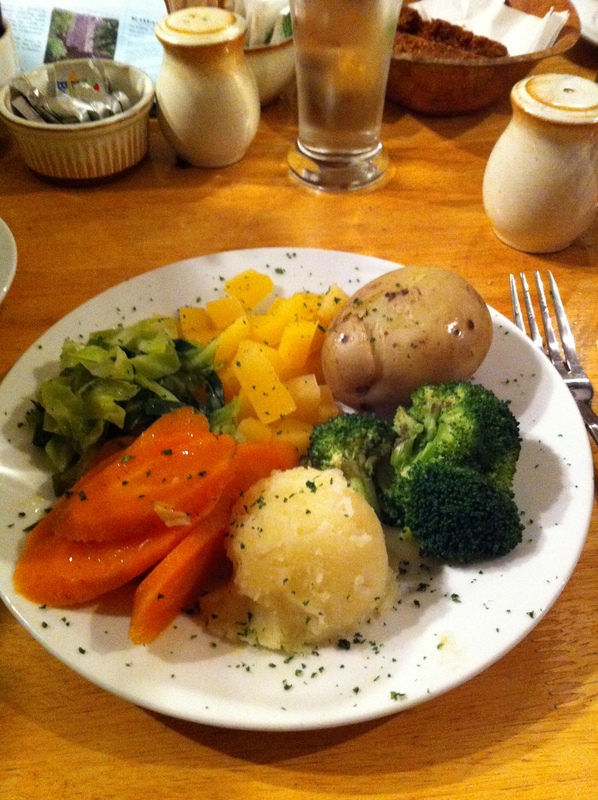 It really wasn’t that bad – the Irish really know how to make some great potatoes. I got by with pretty much the same food items for lunch and dinner, supplemented by pistachios. We also managed to go to a grocery store while we were there to pick up some more granola bars and a few bananas. I definitely didn’t go hungry. My recommendation to you, if you’re vegan and traveling to Ireland: definitely bring snacks and seek out some vegetarian or vegan restaurants for some more variety. Just like with any international experience, it’s probably there somewhere… you just have to find it. Overall, I had a wonderful time in Ireland and feel much more comfortable traveling internationally as a vegan. I did, however, start with an English speaking country. I can’t imagine speaking to a server who doesn’t know a word of English and trying to explain that I don’t eat meat, dairy, eggs, etc. I’ll have to see how it goes because it looks like I have a few more international trips coming up this next year! I just returned from a ski trip to Colorado and I was just as impressed with the slope-side vegan food options as I was with the skiing. I spent four days on the slopes, skiing and eating at three different mountains. I was lucky enough to stay with my aunt who had rented a condo for six weekends in the town of Breckenridge, Colorado – we absolutely loved stocking her kitchen with food and spent a few evenings eating at home. We spent two days skiing at Breckenridge Ski Resort which I absolutely adore. I always packed a tortilla with peanut butter and a granola bar for my jacket pocket but also got to visit the lodge for lunch. The food court at Peak 8 called Ski Hill Grill had plenty for me to eat. In addition to their full salad bar, they also have an Asian food station where I tried the vegetable stir fry and tofu over rice bowl – delicious! Also on Peak 8, take the Colorado SuperChair up to Vista Haus, which also has a food court with plenty of options: Asian station, Mexican station and newly added sushi bar (which I just found out on their website). You will never go hungry at Breck. One night we ventured into the town of Breckenridge and ate at Kenosha Steakhouse. They had the usual veggie-burger option on the steakhouse menu. I’ve been kind of tired of veggie burgers recently so I decided to keep drinking wine and order two sides for dinner: the rice and the veggies. The veggies were seasonal which was nice. They were pretty small sides though so I ended up stealing some fries off of my friend’s plate. Next time I’d probably go with the vb. Just down the street is Keystone Ski Resort with an absolutely gorgeous slope-side lodge called The Outpost. Again, it was hard to choose what to eat! They had a full salad bar, veggie burger, veggie soups, and more. I brought my lunch instead but managed to take a walk through the food court and have vegan food envy like crazy. On our last day in the mountains, we drove about 45 minutes to Vail Ski Resort which is absolutely enormous. I went in and out of a few lodges trying to meet up with my cousins… so since I frequented so many on accident, I can report on a few of the dining options. I would highly recommend eating at Two Elks Lodge which is much bigger and nicer than some of the other food options on the slopes, and it is right near the back bowls. They have a salad bar, burrito station, and lots more to choose from. I went into Wildwood Barbeque but there didn’t seem like much on the menu for vegans: maybe the veggie chili or French fries but don’t waste your time when you can ski to better options. If you find yourself at Wildwood and ready for food, ski down to Mid-Vail which has a small but upscale food court with a salad bar, prepared-food sushi bar, and Asian station. I got the coconut curry tofu and veggies over rice but I’m not sure I’d get it again; I wish I’d eaten at Two Elks Lodge when I had the chance! After a long day of skiing, we ended up at a slope-side restaurant at the top of the Lionshead Gondola for some après ski food and drinks at Game Creek Restaurant. I filled up on wine and bread because it looked like the only vegan option on the menu was a salad… yuck. There’s a Subway in the Lionshead village on the way to the garage if you want to grab a veggie sandwich for the ride home. All in all, I was much more impressed with the mountains and lodges in Colorado than I was with the slopes and food options in the Northeast. I’m not sure how I’m going to go back to Northeast skiing next season. My experience in Colorado can be summed up by Vail’s tagline: Like nothing else on earth. No Vegetarian Option on Your ENTIRE Menu? I’ve been very vegan confident recently, telling people that there is pretty much something vegan on every restaurant menu – restaurants are getting good at including the garden burger or the hummus wrap on their menus these days. BUT, I skied into a restaurant (slope side) at Sugarloaf Mountain in Maine called Bullwinkle’s Bistro and I was astounded that I couldn’t find a single vegetarian item on the menu, not one. I was with my carnivore cousin who immediate said, “Oh look, there’s a turkey burger!” implying that I’d have something to eat. And then after a short pause said, “I forgot that turkey isn’t vegan.” Then he said, “at least there’s a vegetable soup…” but when I looked closer at the menu items I realized it said “vegetable beef soup.” Oops. It was one of those cafeteria-style places where you order up front and then take your food to the cashier and sit down. I went over to the burger counter and made eye contact with a chef and said, “what do you have for vegetarians?” He looked at me and shook his head, “well, nothing,” he admitted. “Absolutely nothing for vegetarians? No garden burger? Vegetable wrap? I mean, what are we supposed to eat here?” He hesitated and said, “I’m really sorry, we have nothing on the menu that is vegetarian.” I continued, changing my tone a bit, “how can you not offer a vegetarian option? You’re telling me there is nothing I can eat in this entire restaurant?” He finally thought for a minute, “I mean, I guess I could put some veggies on some bread.” Yes! I got really excited which kind of made him a bit excited too. He went over to another chef and started talking and then I heard the other chef say, “artichoke hearts, add those too.” He finally made this unbelievable veggie sandwich with lettuce, tomato, basil, onion, pickles, and artichoke hearts. It was seriously the best veggie sandwich I’ve ever had. Better yet, when I went to the cashier with my sandwich (and chips and pickles), the chef came over and said, “Don’t charge her for the sandwich; it’s our fault that we don’t have it on the menu.” Boom! I think I actually turned a light on in this chef’s head. What’s more? I got a free lunch out of it! I’ve realized now that being a vegan in a non-vegan world sometimes means you have to be pushy to get what you want, but trust me, sometimes it works! At the beginning of 2011, I dusted off my parents’ old vegetable juicer that had been sitting dormant in their basement for about ten years. After reading a number of books about veganism and the magic of juicing, I figured it was time to try it. My dad and I cleaned off his commercial Champion juicer and decided to put it back into action. We made a trip to Whole Foods and picked out organic produce to put through the machine (it’s important to only juice organic fruits and veggies so the pesticides don’t get in your juice and then in you). After two months of juicing, we have juiced the following fruits and vegetables: cucumber, celery, fennel, broccoli stalks, kale, romaine lettuce, green leaf lettuce, Boston red lettuce, green bell pepper, spinach, tomato, carrot, apple, pear, and lemon – not all in the same juice of course! I try to mix and match but pretty much always use cucumbers and celery as a base. Easier and faster nutrient absorption. Juicing helps you absorb all the nutrients from the vegetables which is important because most of us have impaired digestion as a result of making less-than-optimal food choices over many years. Juicing allows the body to quickly absorb larger amounts of nutrients because the process of digestion that is necessary when you eat whole food is bypassed. Optimal amount and variety of vegetable consumption. If you tend to eat a lot of carbohydrates, you should eat one pound of raw vegetables per 50 pounds of body weight per day. Some people may find eating that many vegetables difficult, but it can be easily accomplished with a quick glass of vegetable juice. Juicing also allows you to add a wider variety of vegetables to your diet. Many people eat the same vegetable salads every day. This violates the principle of regular food rotation and increases your chance of developing an allergy to a certain food. But with juicing, you can juice a wide variety of vegetables that you may not normally enjoy eating whole. Enhanced immune system. Juicing also ensures that the body is getting sufficient amounts of phytochemicals, substances in plants that are considered among the most powerful ways to fight disease. In addition, antioxidants and other immune enhancing properties are concentrated in juices. Drinking juice recipes regularly is going to give you a wide variety and more than adequate amount of antioxidants which are essential for a healthy immune system. Increased metabolic rate. Enzymes in fresh fruits and vegetables have the vital role of converting food into body tissue and energy. Enzymes are also involved in metabolism, so one of the more valuable health benefits of juicing is that it can increase metabolic rate. Juicing is a process – I don’t recommend starting with “hard to drink” veggies like kale, collard greens, or mustard greens. If you are new to juicing, I recommend starting with vegetables that are easy to digest in juice form: celery, fennel, and cucumbers. Also start by drinking smaller amounts of juice at one time (try 8 ounces) to prevent you from getting nauseous or turned off from the juice. When you are ready to tackle more vegetables, try lettuce (red leaf, green, and romaine), spinach, cabbage, and bok choy. You might then try adding herbs to your juice, like parsley or cilantro. Once you are a pro juicer, try those “hard to drink” veggies that I mentioned above – they are unbelievably good for you. Juicing is best first thing in the morning but I seem to consistently juice late afternoon as more of juice-snack. I’ve read that it’s best to separate juice consumption and food consumption so I usually don’t eat solid foods an hour before or after I drink juice. For healthy juicing, I recommend juicing three vegetables to one fruit to minimize sugar intake (carrots count as a fruit with this rule since they are higher in sugar than other veggies). Making vegetable juice is almost impossible to do while traveling since you need a vegetable juicer (or a blender) and fresh produce. Vegetable juice isn’t great to store or pack either since the nutrients will be the most beneficial right after the vegetables or fruits are juiced. So if you are a business traveler, and are interested in drinking juices on the road, I would recommend finding a local restaurant or café that has a commercial juicer and serves vegetable juice. When you do get a break from the road, I highly recommend doing some juicing at home – your body will thank you for it! I’ve had the opportunity to be a serious skier this winter and have visited five Northeast ski resorts since the beginning of January (Bretton Woods, Loon, Waterville Valley, Cannon, and Sugarbush). My first few times going, I made sure to pack my own food but after a while, I started to notice that all of the mountains have something for vegans to eat in their lodge food courts or restaurants. At Bretton Woods Ski Resort in New Hampshire, the food court options include a vegetarian soup (the three bean vegetarian chili is great), a veggie burger, or regular oatmeal. Bretton Woods also has a restaurant on the slopes called Top o’Quad Restaurant with an excellent olive tapenade (but ask for the bread without butter). Waterville Valley Ski Resort has similar meal options to Bretton Woods but also some great vegan snacks: Me & Ollie’s Granola Munch, baked chips, protein bars, etc. The grilled vegetable burger (without the cheese) at the restaurant at Sugarbush Vermont Ski Resort and Golf Club in the Mad River Valley was excellent as well. We dined at the Castlerock Pub – located in the Gate House Lodge at Lincoln Peak. This wasn’t even the only vegan option on the menu; they also have a vegan Castlerock Salad and a Portobello Wellington sandwich that I didn’t get to try. We ate our meal on the couches in front of the fire – such a relaxing way to break up a day of skiing. If you decide to stay over at a resort lodge for the weekend, many of them offer breakfast in the morning. I stayed at the Comfort Inn & Suites in Lincoln, New Hampshire (near Loon Mountain) and made an English muffin with peanut butter at the complimentary breakfast station. I usually always have an oatmeal packet with me just in case there aren’t any vegan options for breakfast – there is always hot water for oatmeal. If you decide to pack your own food for a day trip or weekend trip, here are some of my recommendations of healthy picks that are easy to grab at a local grocery store and pack for the weekend. For breakfast I usually bring fruit for the car ride or I stop to pick up a multi-grain bagel at Dunkin Donuts or any other breakfast joint. For lunch, I like to pack some multi-grain bread or tortillas, peanut butter (either a jar or single-serving packets, which you can get at Whole Foods), and a banana to make a delicious “peanut-butter and banana sandwich.” My non-vegan friends are usually jealous when I start putting this sandwich together so make sure to bring enough to share! I also try to bring a lot of snacks: apples, grapes, hummus and pita, and multi-grain pita chips. I love bringing edamame and mixed nuts for some additional protein for extended energy on the mountain. If you don’t have time to pack snacks, however, I guarantee that most mountain lodges and restaurants will have something vegan on the menu to get you through the day. I have a ski trip to Colorado in March; it will be interesting to see how the vegan options at the Northeast mountains compare to those in Colorado. For New Year’s weekend, I decided to make a road trip to Philadelphia – the city that I was consulting in when I started my vegan endeavor. I had three very interesting food experiences from this trip at Monk’s Café, Govinda’s Vegetarian, and Subway. We stumbled upon Monk’s Café on a walk towards Rittenhouse Square looking for a vegan-friendly lunch spot. I had been to Monk’s Café before I became vegan and I remembered noticing some great vegan options on the menu. I asked the server what he would recommend: the Vegan Burger or the Vegan Seitan “Meat Loaf.” I took his recommendation and ordered the burger. When the plate came out, I noticed some mayonnaise on the burger bun and in a little side cup on the plate. It had to have been a vegan mayonnaise, right? I decided to double check with the server and his response was, “No, that isn’t vegan. You never told me you were vegan.” WHAT?! When I order a dish that is titled “Vegan Burger” I have to tell the server to prepare it vegan? When I ask the server to make a recommendation between two vegan entrees, he didn’t assume that I’m vegan? I was shocked. Note to all of you vegans out there: even when you order a vegan dish at a non-vegan restaurant, make sure to let the server know that you would actually like it prepared without any animal products. Ridiculous. My second food experience, at Govinda’s Vegetarian on South Street, was the polar opposite. I stumbled upon this restaurant for brunch on New Year’s Day and it was fabulous. I couldn’t decide between the Philly Chicken Cheese Steak and the Zucchini Melt. I went with the Zucchini Melt but felt bad about my decision (since I was in Philadelphia and where else can you get a vegan Philly Chicken Cheese Steak??) but when I tried the Zucchini Melt I was in heaven. They also had an assortment of vegan cookies and cakes to go, but I had to say no. I mean, it was only New Year’s Day and I had to stick by my New Year’s resolution of giving up vegan junk food. I definitely recommend this place. On my drive back to Boston, I decided to stop at a Subway for lunch. Fast-food restaurants are terrible when it comes to vegan or vegetarian options. I originally asked about the Vegetable Pattie but the server said it had egg. I decided to get all veggies on the wheat bread: lettuce, spinach, tomatoes, cucumbers pickles, and olives. The server kept saying, “Wait, that’s it?” And I would say, “Yes – it’s a pretty big sandwich!” “You really don’t want any meat or cheese?” “No, thank you.” Then as I was paying for the meal he goes, “Are you vegetarian or something?” I smiled. I’d be lying if I said that ordering a meal as a vegan was seamless. This one was one of the more awkward times. After not traveling quite as much, at least not every week, I have come to realize that traveling as a vegan is actually much harder than preparing meals at home. It’s not always about the lack of food options; it’s sometimes more about the people in the way. Luckily, I don’t have as many trips planned for January and February. After six months of being vegan, I had a new challenge at my plate: eating vegan over the Thanksgiving, Chanukah, Christmas, and New Year holidays. Maybe I’ve “gotten good” at being vegan, or maybe my expectations have changed, but I was rarely left hungry or unsatisfied. Thanksgiving was a particular feat, and one that I enjoyed. My family spends Thanksgiving at my Uncle’s house; I knew I would be the only vegan or vegetarian in attendance. Recommendations told me that I should bring my own vegan dish to share, so the host (my aunt) didn’t feel uneasy about the lack of food options for vegans. I left the Tofurky at home, however, and decided to bake and bring a vegan banana bread. This was my first time baking something vegan and it turned out really well! Good thing I made two loafs because the first was gone before Thanksgiving dinner even started. My non-vegan family loved it! I found the recipe online (see below). Turns out, there was plenty of vegan Thanksgiving food for me to eat. There was a string bean dish and cinnamon squash (sans dairy) and my aunt even made a separate black bean salad with tomatoes, onions, and artichokes, just for me. I was in veggie heaven. Chanukah is an easy holiday for vegans. You can easily make or find vegan latkes and applesauce. I didn’t get to try my latkes with vegan sour cream but I know it’s out there. Christmas Eve dinner was a little bit more of a challenge. Since I’m Italian, my family likes to follow the tradition of incorporating “seven fishes” into the feast. Oy. I was able to eat a string bean and almond dish, which was delicious, but that was the only vegan option (other than salad, yuck). I really should have planned ahead and thought about preparing something, but I never quite got it together. Luckily though, my parents gave me two cookbooks for Christmas this year: How to Cook Everything Vegetarian and The Complete Italian Vegetarian Cookbook. I no longer have any excuses. Overall, I had a very satisfying vegan holiday season. Next year I definitely want to try Tofurky Turkey on Thanksgiving and prepare an Italian pasta dish for Christmas. 1. Preheat oven to 350 degrees F. Grease/spray a 9″ square baking pan; set aside. Put one teaspoon vinegar in a liquid measuring cup and add enough soy milk to equal 1/4 cup; mix together and set aside. 2. Meanwhile, in a separate bowl, mix dry ingredients together; set aside. In another bowl, beat oil, vanilla, and bananas. Gradually add in dry ingredients as well as the milk mixture. Beat until smooth. 3. Pour batter into prepared pan. Bake for 25-30 minutes until brown on top and toothpick inserted near center comes out clean. Serve warm, if desired. Notes: You can add nuts or desired spices (like cinnamon). This can also be made in a standard size loaf pan (adjust cooking time accordingly). Serves: 10, Preparation time: 10 min. Stop by the prepared food section and refrigerated section for some vegan eats at Whole Foods. Many Whole Foods stores have Macro & Vegan prepared meals: Chicken Lo Main, Soba Noodles, Spinach Noodles, etc. You will definitely be able to find a prepared veggie or salad in that section as well. You can never go wrong with fruits and vegetables. I love grabbing a few apples and oranges because they are easy to travel with and stay good for a while. I also like to pick up a bag of Spinach (microwave it in the bag) as a very quick and healthy meal or side dish. If anyone else has any vegan favorites or favorite grocery stores, let me know! For the past five months, I’ve been dating someone of Vietnamese decent and he graciously introduced me to the world of Pho. I love everything about vegetarian Pho: the rice noodles, the warm vegetable broth, the medley of vegetables, and the soft tofu. It’s such a great, healthy meal for lunch or dinner, or for breakfast if you like it as much as I do. I’ve been converted and I now I’m started to introduce Pho to my friends, or correct some of my friends for pronouncing it incorrectly. I’ve been to two Vietnamese restaurants in the Boston area: Pho Pasteur on Beach Street in Chinatown, and Pho Lemongrass right outside of Coolidge Corner in Brookline. I have to admit that Pho Pasteur was definitely our favorite – it seemed much more authentic and the Pho had more flavor. Since Pho Lemongrass is so close to my house, I’ve visited four times already in the past month (I know, kind of ridiculous) and I’ve tried something different every time. Vietnamese restaurants (as well as other Asian cuisines) always have great vegetarian options. In addition to the Vegetarian Pho with Tofu, I have also tried the vegetarian Summer Rolls, a delicate rice paper rolled around tofu, lettuce, and Asian basil and served with chilled peanut sauce. Summer Rolls are traditionally served as an appetizer. On another visit to Lemongrass, I ordered the Vegetarian Delight. This dish came with steamed peppers, onions, carrots, broccoli, summer squash, zucchini, string beans, and snow peas in a light soy sauce – another healthy and flavorful Vietnamese entree. I have also tried the Tofu and Spinach dish which came in a tasty brown sauce with brown rice on the side. It’s been great trying all kinds of vegan Vietnamese dishes, but the more I branch out, the less I get to eat Pho! I’ve been so lucky to have such good friends (and dates) – people who have introduced me to new vegan entrees. At some point in my life I’ll have to try vegetarian Pho in Vietnam and see how it compares. I’ve flown Continental Airlines (which will soon become United) about 20 times in the past three months and I’ve officially determined that there aren’t any vegetarian or vegan options for dinner on the Thursday evening Houston-Boston flights. The morning and afternoon flights are a little better but I wasn’t often on the afternoon flights and I was usually asleep and not interested in food on the morning flights. But the evening flights were particularly important: I would run from the client site to the airport to catch the 6:40pm flight and didn’t get back home until midnight at the earliest, so food was essential. If I didn’t have time to grab food from the airport for dinner before I boarded, I was out of luck. Continental Airlines has consistently been serving chicken wraps or turkey dogs as the main meal item, with Doritos, a small carrot pack, and M&Ms as sides. The chicken wraps aren’t even in “normal” wrap style: the wrap looks fried and infused with butter or oil. Even if I wasn’t vegan, this wouldn’t be something I’d eat for dinner. Regardless, the only vegan option in the “dinner box” is the carrots. There are about five mini carrots included in the mini-plastic bag which definitely isn’t even worth accepting the box for. I used to ask the stewardess for a vegetarian option (I asked on a few of the flights) and they would always say no. I wondered if I could request a vegan/vegetarian option before the flight, but since it is considered a domestic flight “snack,” it wasn’t possible. I have started to be a little bit more understanding about this situation. I guess it wouldn’t be very cost effective to stock a few vegetarian/vegan options on every flight; however, this situation is very frustrating regardless. Even if Continental decides not to accommodate vegetarians and vegans, they should still be mindful of the overall health of their travelers. I can guarantee that the meal they are serving is far from healthy, just by looking at the grease that is left behind. I’m not asking for something vegan on the plane, but I am asking Continental to re-consider their food option in general. If they are going to go through the trouble of stocking one meal on every single long evening flight – they should think about both what their customers want and what is good for them.